We were thrilled to introduce the new Intelliguard® Linked Visibility Inventory System™ to anesthesiologists and pharmacists at ANESTHESIOLOGY® 2016 (ASA) and the California Society of Health-System Pharmacists (CSHP) events last month. What is the Intelliguard® Linked Visibility Inventory System™ (LVIS)? 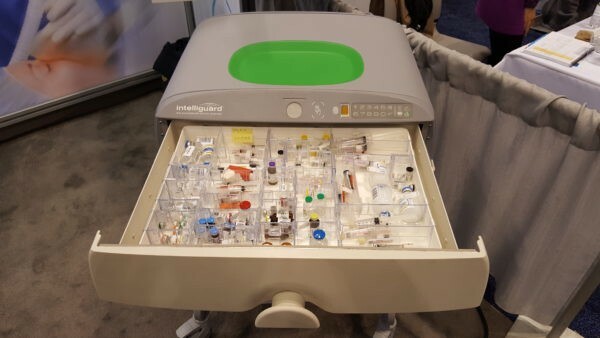 Intelliguard® LVIS™ is the first medication inventory optimization system uniquely designed to support anesthesia care teams. Using patented and exclusive RFID technology, LVIS™ automatically captures data on every medication removed or returned – with no scanning or manual recording required – allowing care teams to focus on patient care while providing pharmacists with the accurate, real-time inventory information they need. The response to LVIS™ has been tremendous and we appreciate all the input and feedback we have received. If you’d like to learn more about the Intelliguard® LVIS™ for your pharmacy please contact our product management team at lvis@intelliguardrfid.com.